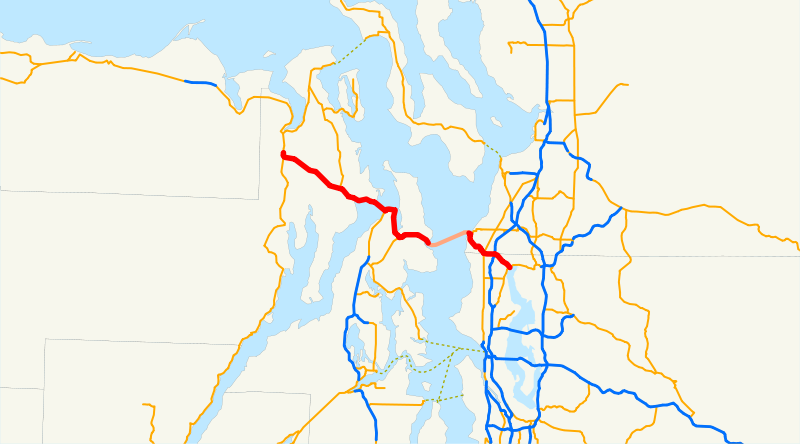 On Sunday, August 1, 2010, I drove the length of Washington State Route 104, from somewhere south of Uncas, east across the Hood Canal Bridge and the Kingston ferry, all the way to the great city of Lake Forest Park. 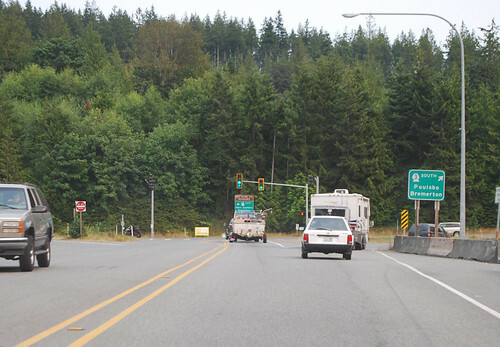 In a small valley south of Discovery Bay, SR 104 begins at an interchange with US 101. Let's go up that hill! Over the hill into the next valley, we pass by the barn home of the Olympic Music Festival. 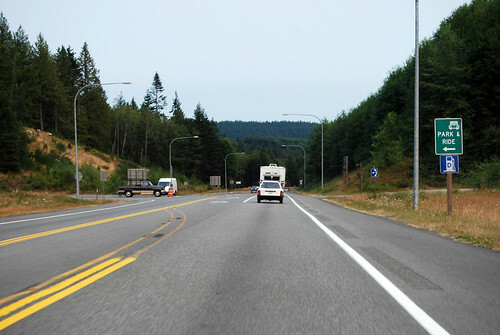 Over the next hill we find a junction with SR 19. Soon we see Hood Canal, and then the Hood Canal Bridge stretches ahead of us. 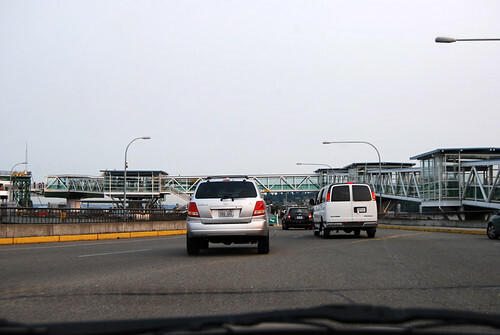 It's the longest floating bridge in the world that's across water with tidal fluctuations. 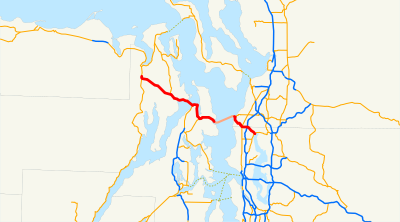 Also it's the world's third-longest floating bridge of any kind, behind a couple others in the Seattle area. This marvel of a bridge carries us to the Kitsap Peninsula and a junction with SR 3. Do you want to go to Bremerton? Take a right. 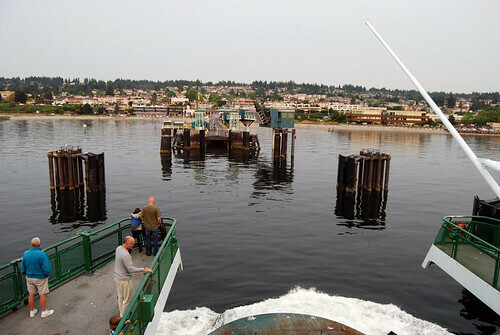 The WSDOT radio and signs suggested we'd save time by going to the Bainbridge Island ferry. Only a one-hour wait there, while a three-hour wait ahead in Kingston... We stay on 104 and take a left. 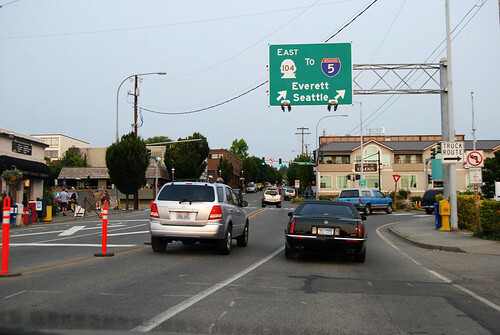 Through the quaint city of Port Gamble and south along Port Gamble Bay, we proceed to a junction with SR 307. 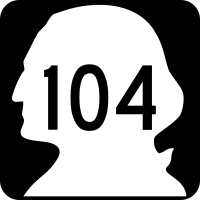 Once again, we must take a left to stay on 104. 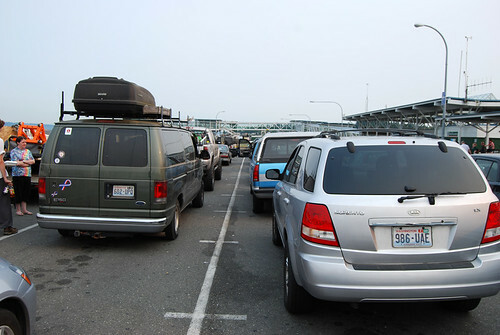 Despite the signs and radio saying there was a three-hour wait, we soon discovered that our wait would be less than an hour -- if our ferry was on-time. The previous ferry was on-time, but not ours. So sad. Walk around Kingston; enjoy the strangely orange sunlight. Since it turned out to be over an hour from the 307 junction to when we got to the end of the road, here's a halfway photo. Sitting in line. The Walla Walla arrives, reguritates a load of cars and pedestrians, then lets us on. Time for a ride. Once loaded and fifteen minutes late, we sail. 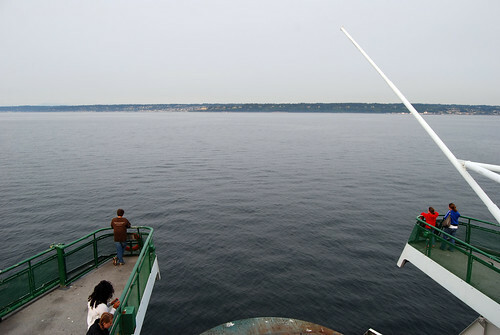 Welcome to Puget Sound. Enjoy the seagulls! Shortly thereafter, Edmonds. Drivers should now return to your cars. 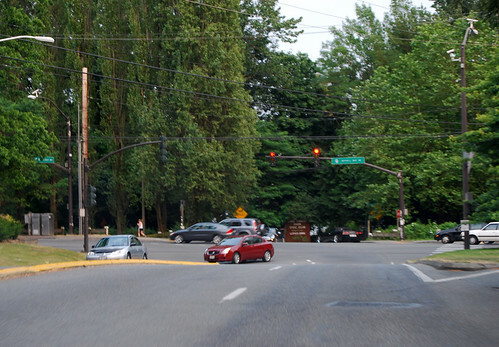 Off the dock and back on solid ground, we find an unsigned junction with SR 524. 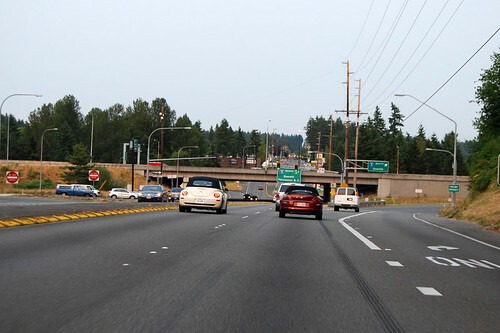 In case you didn't know, stay straight to get on that route to Lynnwood. Up the winding hill till we arrive at SR 99. From all the trees, you'd never know how many businesses are along that road. Past Lake Ballinger (zig two lanes to the right and zag two lanes to the left), we quickly get to I-5. 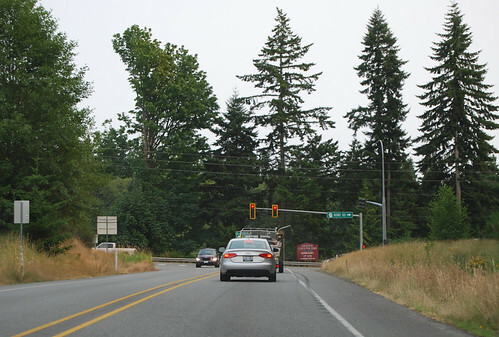 Down the hill into Lake Forest Park, slow down, slow down, till we're almost at Lake Washington. 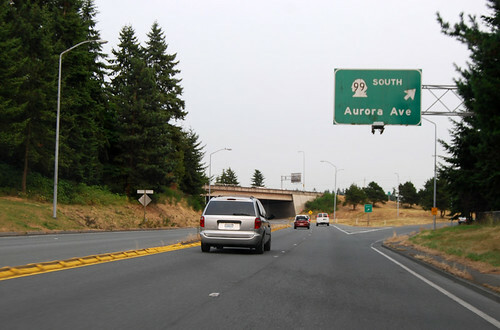 It is here, at a junction with SR 522, that 104 ends. Almost back to home sweet home. 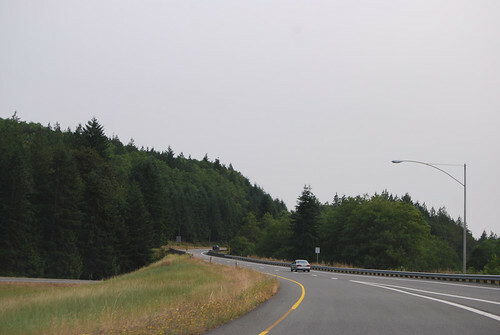 SR 104 is an odd mix of beautiful bays and clearcut forests. Quaint towns, pleasant boat ride, unique bridge.